In today’s society, we are consistently pushing towards a greener, energy efficient, environmentally friendly sources of energy. This movement also encompasses power generators. There is a wide range of top quality solar generators to choose from. The power output of these generators also spans a wide range, so, whether you are seeking a small capacity generator for weekends away or a heftier model which could power a range of appliances, there is sure to be something on the market to match your needs. It is never easy to choose the ideal model, for that reason, we have put together a guide on several of the best generators available to help you come to an easier decision. We have included a range of models which vary in the power they deliver. This ensures that there is something present for everyone. Consult this guide at your leisure and make the most informed purchasing choice possible as you enter the world of solar powered generators. The first in our guide of the best solar power generators is the excellent Renogy Phoenix. This model encompasses a powerful output with maximum convenience thanks to its totally built-in solar power kit. The first thing to catch the eye of the Renogy Phoenix is the briefcase style design. This is super in allowing for ultimate portability as well as being a stylish addition to your home. The Phoenix features 20 Watts of built-in solar power which can be expanded up to 120 Watts of power capacity through the purchase of additional mobile solar paneling. This is enough power to provide ample charging for many mobile devices such as cell phones and laptops, making this the perfect model to use on the go. This moded features many input and output ports supporting both AC and DC power as well as USB outlets. Connectivity needs never be an issue with the Phoenix. The model comes with a replaceable lithium-ion battery pack so you can keep charging for even longer. 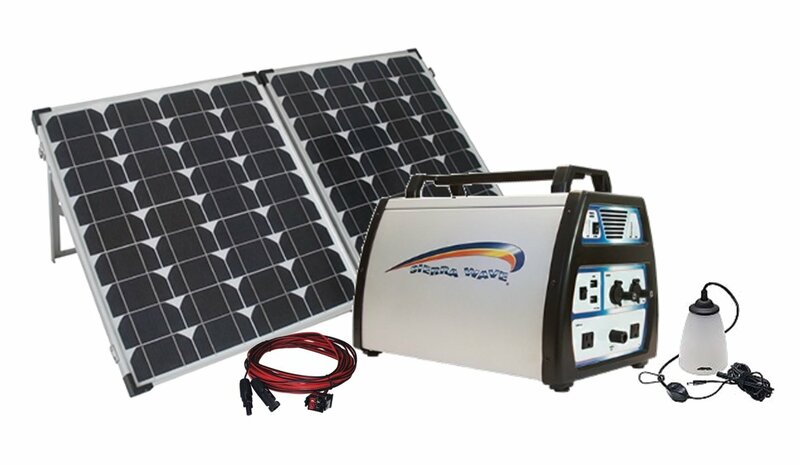 Using the solar power, the generator can be fully charged in only a few hours. Weighing in at under 20 pounds also ensures that the Phoenix can be carried almost anywhere, perfect for camping trips and other off the grid activities. Along with being solar powered, it can also be charged by traditional means. Grab the best deals on this model and many more by heading over to Amazon to check out the latest prices. Next up is the Gusto 20, which, with its bright yellow color scheme, certainly manages to stand out from the crowd. It also delivers an excellent abundance of highly mobile, solar charged power. 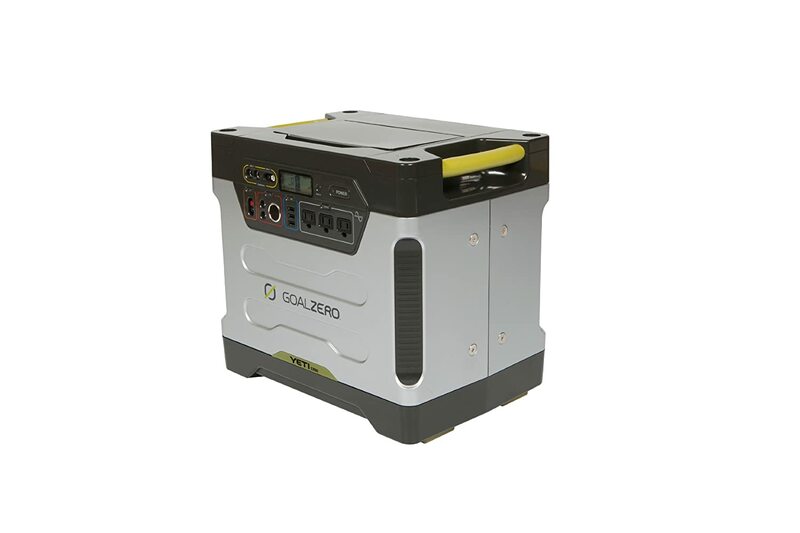 Delivering up to 140 watts of power, the Gusto 20 is ideal for charging all of your mobile devices on the move or many of your small to mid-level home appliances and lighting in the event of an emergency. With multiple USB and other outlets as well as the ability to power not only from solar but also from the external battery and wall plug, you can be sure never to end up in the dark with this model. Weighing in at only 7 pounds, the Gusto 20 is highly transportable and also deceptively durable thanks to its hardened plastic casing. The lifepO4 battery also boasts that it can be charged as many as 1000 times without any loss of capacity. This is a great feature which ensures value for money through longevity for the Gusto 20. It also comes with a one year warranty as standard. Therefore you can trust that help is at hand in the unlikely event of a problem. Perfect for lights, cameras, cell phones and similar devices, your next trip will be greatly enhanced with the Gusto 20 as your traveling partner. The Acopower folding solar panel kit is one which perfectly compliments the Gusto 20 and at 100 watts of power, fully enables the most effective level of solar energy provision to maximize output. This panel can be purchased separately here. For more information on this model and the best possible prices. Swing by Amazon to check out the latest deals. Stepping up the power with our next offering, the Easy Focus offers an impressive 500 Watts of output from its solar generator. The increased power make this model a great choice for powering multiple items both inside and around your home or workplace. Again weighing in at a very light 7 pounds, the increase in power output does not detract from the portability of this model. It can easily travel with you on any excursions. With 4 USB, 4x12V DC and 3x110V AC Outlets, you are certain to have options regardless of your devices connector type. The Easy Focus also neatly features an LED light which can be used as an outdoor torch. This could come in especially handy in isolated areas or in a time of power outage. With the increased power capacity also comes improved performance in terms of charging times. The Easy Focus boasts up to 8hrs of charge time for your laptop. The most suitable solar panel which is compatible with this model is the Renogy 100 Watt folding panel. This fully engages the solar energy capacity of the Easy Focus and can be conveniently found here. 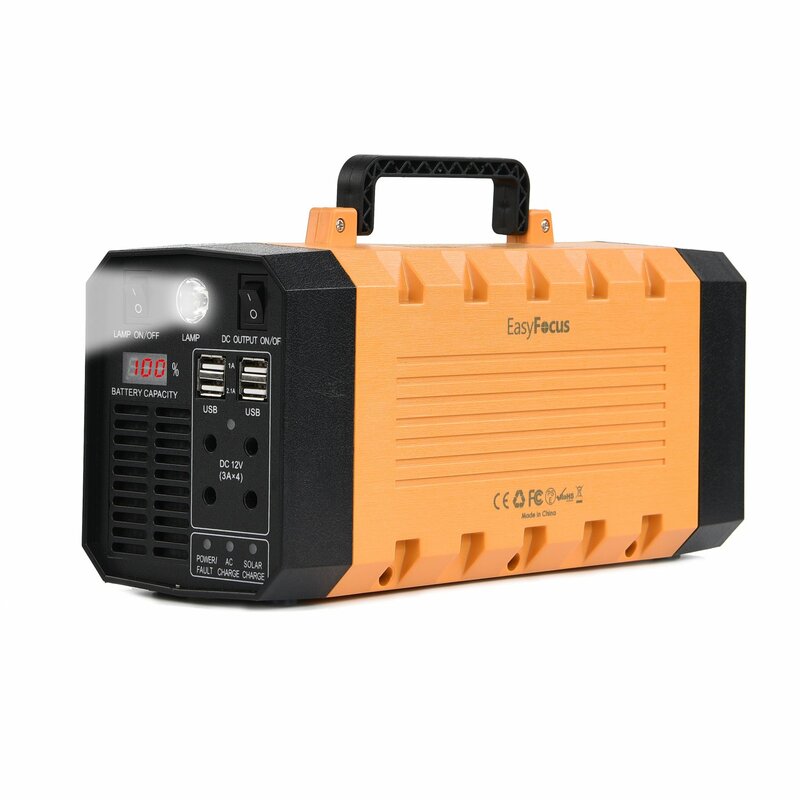 This compact, lightweight and versatile model is perfect for day trips to the park, beach or camping and a vital partner in times of emergency as a durable power source. For the very best prices on this tough and ready model, check out Amazon now. Continue to move up the power ladder, our next product comes from the industry heavyweight Goal Zero and forms part of their impressive Yeti range. Offering an impressive 1250 watts of power, the Yeti is more than enough to satisfy your most power hungry devices. This model is chargeable both by a solar panel and AC connection. From a design perspective, this model is a stylish one. It possesses two handles on either side of the device which means you can easily carry this 103-pound generator between locations. Charging with solar panels which are sold separately brings the obvious bonus of no pollution and no noise. This makes it a perfect companion for camping and fishing trips as well as home. Furthermore, for those requiring a power boost to this already powerful generator, it is chainable, meaning it can be connected to other Yeti models in order to boost power output. This can be ideal for group outings to help increase capacity. 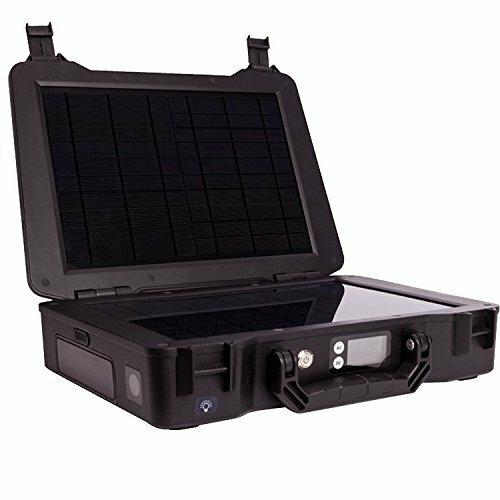 A folding 100 Watt, monocrystalline solar panel which is the best combination with this Goal Yeti model can also be found by clicking here. The Yeti 1250 can easily support multiple devices such as cell phones and laptops with its variety of USB, AC and DC power connectors. The model also features a slick and easily readable LED screen to display the power status and other notifications. For the most up to date prices on the Yeti 1250 and our other models, head over to Amazon. Rounding off our review of the best solar power generators with another big hitter. The Sierra Wave 1500 offers a powerful energy source capable of powering any of your household or work appliances alike. Coming together with a 120-watt Monocrystalline Solar Panel, this model does enough to satisfy all of your power needs in one complete package. The Sierra Wave is also surprisingly lightweight at only 63 pounds. This is advantageous in the fact that you can easily transport it any place for consistent and environmentally friendly power provision on the move. The solar panels themselves can also be easily folded for convenient transportation. 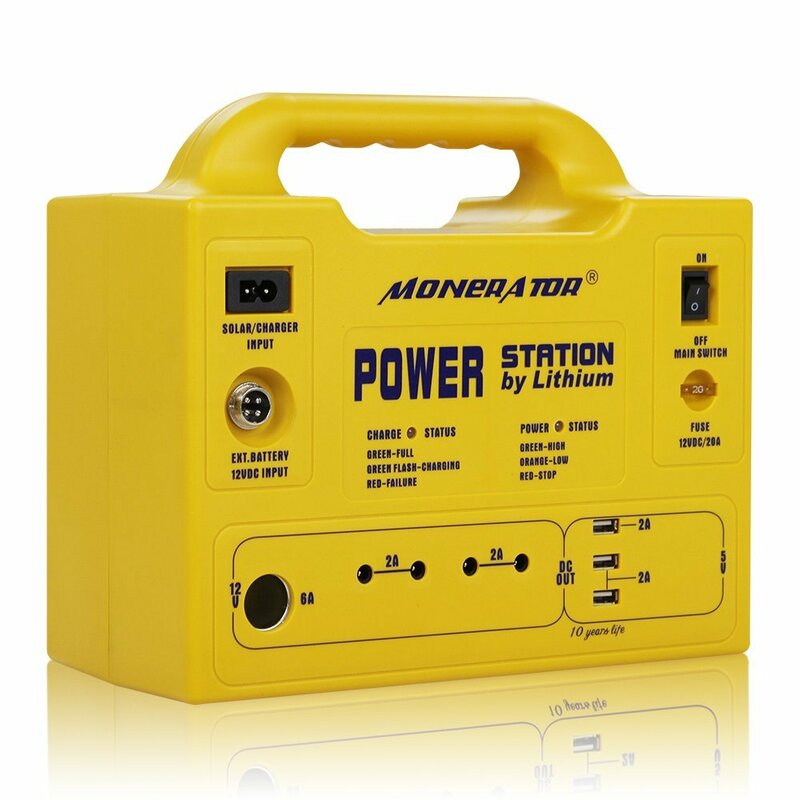 Be the envy of your friends on the next camping trip or tailgating party with this quiet and efficient power source offering hours of powerful charging. Suitable also on the construction site or for DIY power tools, the Sierra Wave is highly durable and ready for any occasion. This model also comes with a powerful LED light as a useful accessory. This provides you with up to 400 lumens per light and can be especially useful in the event of an emergency power outage or late night construction project. This model comes complete with a 120 Watt, folding solar panel as part of the package. Everything you need to start generating your environmentally friendly power. To get the best deals on this impressively powerful, lightweight machine, be sure to have a look on Amazon. There you will find the 1500 and all of the other generators featured in our review, at the most up to date and competitive prices. 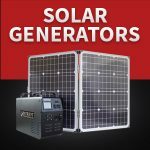 Clearly, there are many excellent quality choices when it comes to your next solar powered generator purchase. With careful consideration and evaluation of your needs, there is every chance that you can find a suitable generator within this guide. By choosing a solar powered generator, you are doing your bit for social responsibility and energy conservation as well as saving yourself money on fueling costs. Keeping your carbon footprint as small as possible is a decision which can have a positive impact on many areas of society. To learn more about a wide array of power generator options and the best quality products at the most competitive prices, be sure to check out our other articles. Our intention is to leave no stone unturned when it comes to satisfying your power generator needs.